What Is The Best Type Of Salt For You? Salt may be different in color such as white, grey or pink too, or it may be kosher. It could be difficult to choose which type of salt is the best for you. You have a lot of options when it comes to shopping for salt. You have the option of buying regular salt or sea salt and coming in different textures like fine or coarse. The salt may be different in color such as white, grey or pink too, or it may be kosher. It could be difficult to choose which type of salt is the best for you. Regular salt or table salt comes originally from rock salt, a natural deposit obtained from the earth. Once cleaned and purified, it forms small and uniform crystals. Regular or table salt is rich in iodine, which is vital for thyroid gland regulation. According to a study conducted by researchers of Linus Pauling Institute, regular iodine consumption is required for proper functioning of the thyroid and in gene expression. 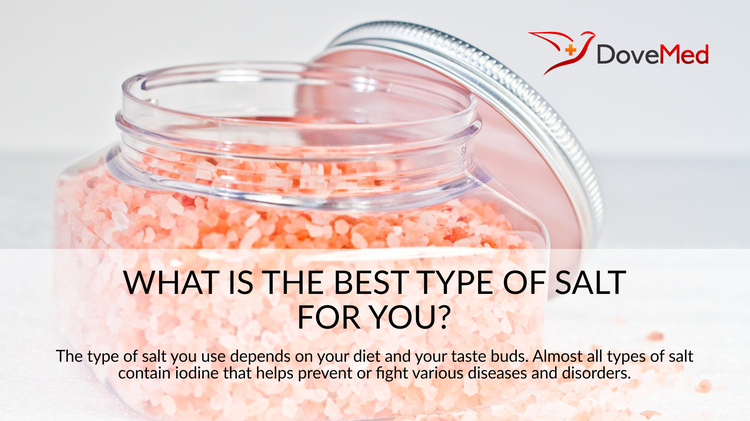 A safer option for obtaining appropriate amount of iodine every day is through regular salt or table salt. The American Heart Association recommends getting less than 1,500 milligrams of sodium a day, which is roughly equal to two-thirds of a teaspoon of table or regular salt. Since, it also dissolves the quickest in food and gives a subtle tangy taste, regular salt or table salt can be ideal for all your basic cooking needs. Regular salt is ideal for daily cooking and baking needs. Sea salt is obtained from evaporated sea water. On cleaning and refining it well, we get the same product as table salt. According to Dietary Guidelines for Americans published in 2005, sea salt is an efficient way to ensure that you regularly get iodine through your diet. The only difference between sea salt and regular salt is that it is processed in a way that produces larger crystals than regular salt. This change in size of crystals makes a difference in how we use it in our food. Larger crystals of sea salt used add more saltiness to dishes in concentration and enhance taste. This variety of salt gives more flavors as well as less sodium than regular/table salt. But bigger granules pose another problem. They cannot be used in regular cooking as they do not dissolve quickly, which can cause texture problem in food dishes. Sea salt is occasionally used as a garnishing agent for soups, salads, and even baked goods like cookies and tarts. Kosher salt is identical to regular salt and sea salt in various ways. They all contain the same amount of sodium by weight and have the same flavor. The big difference lies in the size and shape of crystals. Kosher salt crystals are generally larger and flatter in shape, as compared to regular salt. Because of bigger size and surface area of crystals, they dissolve more easily on our tongue palate, making it a tastier option. These also provide less sodium per teaspoon. Kosher salt is ideal for chefs or cooks who like flatter and lighter version of salt in food to add extra crunch. The type of salt you use depends on your diet and your taste buds. Almost all types of salt contain iodine that helps prevent or fight various diseases and disorders. Salt consumption is very important to maintain a healthy functioning body and mind. Zimmermann MB, Jooste PL, Pandav CS., Iodine-deficiency disorders, Lancet. 2008 Oct 4; 372(9645):1251-62. Khayet, M., & Mengual, J. I. (2004). Effect of salt type on mass transfer in reverse osmosis thin film composite membranes. Desalination, 168, 383-390. Wentzel, N., & Gunton, J. D. (2007). Liquid− Liquid Coexistence Surface for Lysozyme: Role of Salt Type and Salt Concentration. The journal of physical chemistry B, 111(6), 1478-1481. Kitamura, T., & Kato, Y. (1985). Effect of the type of salt on separation of proteins in high performance hydrophobic interaction chromatography on TSKgel phenyl‐5PW. Journal of High Resolution Chromatography, 8(6), 306-307. Füzy, A., Tóth, T., & Biró, B. (2008). Soil-plant factors, others than the type of salt-specific anions are affecting the mycorrhiza colonisation of some halophytes. Community Ecology, 9(Supplement 1), 125-130. Shokri-Kuehni, S. M., Rad, M. N., Webb, C., & Shokri, N. (2017). Impact of type of salt and ambient conditions on saline water evaporation from porous media. Advances in water resources, 105, 154-161.